With Excel 2010’s SmartArt graphic objects, you can quickly and easily construct fancy graphical lists and diagrams in your worksheet. 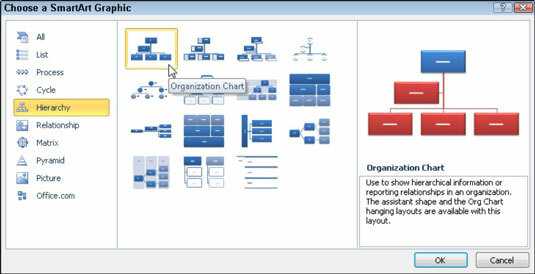 SmartArt lists and diagrams come in a wide array of configurations (including a bunch of organizational charts and various process and flow diagrams) that let you combine your own text with the predefined graphic shapes. On the Insert tab, click the SmartArt button in the Illustrations group. The Choose a SmartArt Graphic dialog box appears. Select a category in the navigation pane on the left followed by the list’s or diagram’s thumbnail in the center section. The right pane describes the selected graphic. Select the SmartArt list or diagram to insert in the worksheet in this dialog box. 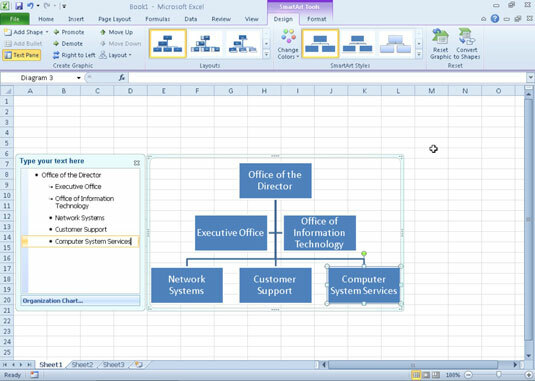 Excel inserts the basic structure of the list or diagram into your worksheet along with a Text pane (with “Type your text here” on its title bar) to its immediate left and [Text] in the shapes in the diagram itself. Also, the SmartArt Tools Design tab appears on the Ribbon. If you don’t see the Text pane (with “Type your text here” on its title bar) to the left of the SmartArt graphic, click the Text Pane button on the SmartArt Tools Design tab. If the Text pane was previously closed, Excel doesn’t automatically display it when you insert a new SmartArt graphic. Type the text for the first object at the top of the Text pane. Click in the first text box in the Text pane, if necessary. The insertion point moves to the text box for the next object in the graphic. Type the text for the next object in the Text pane. Continue entering text in the Text pane. If you need more lines when you get to the end of the list, press Enter. Adding text to a new SmartArt graphic. When you’re finished entering text, click a cell in the worksheet outside the SmartArt graphic. The Text pane closes and the text you typed appears in the SmartArt graphic. If the style of the SmartArt list or diagram you select comes with more sections than you need, you can delete the unused graphics by clicking them to select them (indicated by the selection and rotation handles) and then pressing the Delete key.